Airwolf is a drama loaded with action and adventure thanks to its true star - a science-fiction helicopter named Airwolf. Nicknamed “The Lady,” Jan-Michael Vincent plays its reclusive pilot Stringfellow Hawke and veteran actor Ernest Borgnine is co-pilot Dominic Santini. The storylines in Airwolf are full of espionage and danger, but they also focus on friendship and trust. The ongoing success of the show is not surprising considering that it was created by Donald P. Bellisario, known for other popular series such as Magnum, P.I., Quantum Leap, JAG, and NCIS. 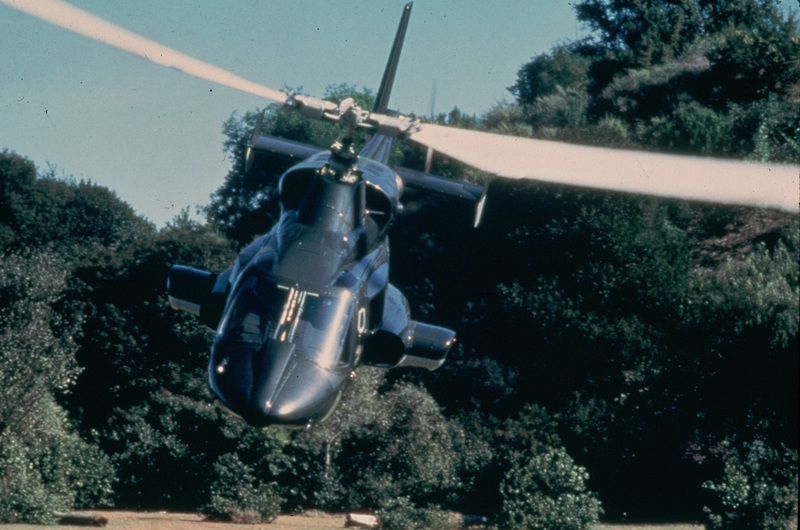 Here are 7 more facts about Airwolf, which can be seen in all its glory weekdays on getTV. 1. Airwolf debuted on TV January 22, 1984. This was an all-around stellar week in entertainment. In music, “Owner Of A Lonely Heart” by Yes topped Billboard’s Hot 100 List. Readers couldn’t get enough of Stephen King’s Pet Sematary, which was #1 on the New York Times’ Best Seller List. In addition, James L. Brooks’ award-winning film Terms Of Endearment reigned supreme at the box office. 2. Airwolf was not TV’s first helicopter series. The first TV show to feature and focus on helicopters was The Whirlybirds, which ran from 1957 to 1960. Featuring Bell 47 helicopters, precursors of the futuristic Airwolf, The Whirlybirds was a half-hour adventure series produced by Desilu Studios. It starred Kenneth Tobey and Craig Hill as charter pilots who often assisted in search-and-rescue operations. Airwolf picked up where The Whirlybirds left off and flew this kind of series into the future. 3. Airwolf was a helicopter ahead of its time. There were a few TV shows featuring helicopters in the years following The Whirlybirds. However, it was the success of the John Badham film Blue Thunder in the summer of 1983 that brought a resurgence of helicopters to TV. All three major networks produced shows featuring helicopters, but it was Airwolf that had the most advanced aircraft. Even by today’s standards, Airwolf is a helicopter way ahead of its time. According to the show, Airwolf is a Bell 222 Stealth Helicopter built by a scientist who worked for a super-secret branch of the CIA called The Firm. The highly advanced vehicle put all government and spy agencies to shame. Airwolf could outrace conventional jets, travel halfway around the world, and attack with devastating results. The helicopter’s impressive assets include a cutting-edge computer, hi-tech surveillance systems, and 14 firepower options. 5. Stringfellow Hawke made a deal with the CIA. The backstory of the series is that Airwolf’s inventor defected to Libya taking the helicopter with him. The Firm then recruited Hawke to get Airwolf back. Hawke complied, but then made a deal – he refused to hand it over to The Firm until they located his brother who was missing in action in Vietnam. 6. Hawke and Santini follow in the classic “buddy” tradition. Santini was a war buddy of Hawke's father, and became Hawke’s best friend and mentor. They are more like family. Santini is Airwolf’s in-flight systems specialist while Hawke is its pilot. Together they run missions for The Firm using Airwolf as a secret weapon to stop all manner of criminal masterminds. These good friends act as stewards to this weapon, which is too dangerous to fall into unenlightened hands. 7. There were real-life Airwolf tragedies. Tragically, Jan-Michael Vincent’s stunt double Reid Rondell was killed in a crash during the show’s run. After Airwolf went off the air, the helicopter was sold to a German charter company and used as an air ambulance. It was in this capacity that it crashed in 1992 and killed the three passengers onboard. 8. Jan-Michael Vincent amazed Ernest Borgnine. While Borgnine was known to say that acting was the easiest thing in the world, he also admitted to spending hours preparing for each episode of Airwolf. His ritual included carefully studying each line of dialogue to put it in the context of his character and the story. Thus he was blown away when he learned his Airwolf co-star had a photographic memory. According to Borgnine, Vincent could look at a script once and be ready to shoot. Be sure to watch Jan-Michael Vincent, Ernest Borgnine, a terrific cast of supporting players, and the greatest helicopter to appear on TV in the action-packed series Airwolf. Weeknights at 2 am ET/11 pm PT on getTV.